A night that had started so well ended in woe as Barça suffered their first defeat of the Liga season. Bottom-placed Leganés produced two goals in the space of a minute to take points off the Catalans for the first time ever. After the first 45 minutes it had all looked like business as usual. The game was just 12 minutes old when the advancing Leo Messi drew almost the entire home defence towards him like a magnet. The Argentinian was indeed closed down, but Philippe Coutinho was left unmarked. A flick, turn and volley from the Brazilian and that was the ball in the back of the net. The remainder of the half was no thriller, but had all the elements we have grown so used to seeing. Barça comfortably in control. Chances aplenty. Messi hitting the woodwork. But no further goals. Though winless and rooted to the bottom of the table, the home side did manage to muster the occasional counter. Ter Stegen was anything but a mere spectator. But surely there was no cause for alarm? Cue the second half, and it all suddenly went horribly wrong. A cross from the left homed in on Nabil el Zhar’s head. Goal. And Butarque was still celebrating the unexpected equaliser when the atmosphere went from wild to bedlam. Oscar Rodriguez made the most of another muddle in the Barça defence to put his side into an even more unlikely lead. 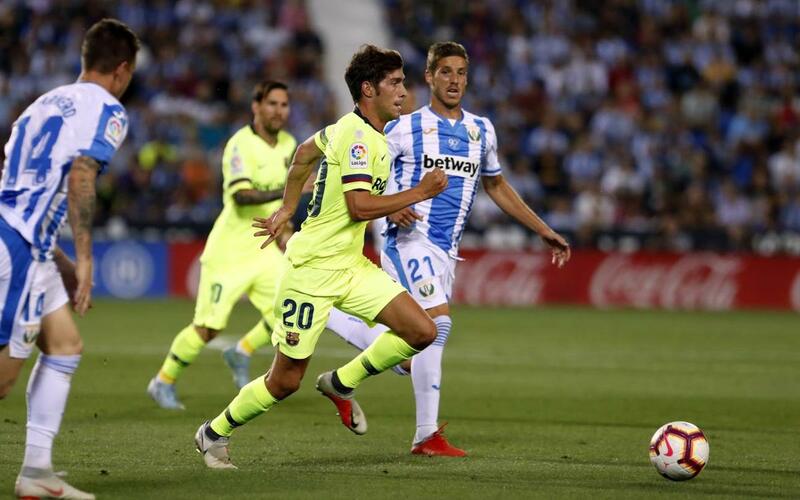 Barça battled hard to get back in contention, but rather than sit back and defend, Leganés looked just as intent on extending their lead as they were on defending it. This was as nervy as football can get, and with Ivan Cuellar outstanding between the Lega sticks, all Barça eyes were on a clock that just wouldn’t stop ticking. As they sensed they were on the verge of making history, Leganés finally did decided to set up camp on the edge of their area, and no matter how hard Barça pressed, they could find no way through.